APN of Docomo – Tata Docomo for Android Samsung, Micromax, Sony. Tata docomo internet setting of android. Some mobiles does not get the apn settings directly when you insert a sim, and this makes you to call costumer care of Tata Docomo, to ask for getting apn setting, to run internet properly on the same. 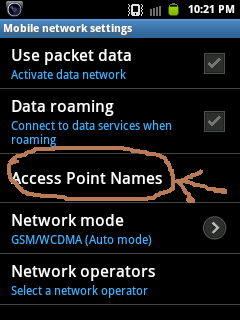 APN Stand for Access point name. I had experienced this problem in Samsung galaxy S, and also with my friend tablet, which made me to write about this information here. Add access point for other service provider like Videocon, Vodafone, Reliance, Airtel, Idea, Bsnl, Aircel , MTNL etc.. We can set this setting in every mobile but, i will demonstrate to set apn in android mobile step by step. 1.) Select Settings, then Wireless and Networks and to Mobile Networks i.e which will flow as Settings -> Wireless and Networks -> Mobile Networks -> Access Point Names (APN). APN of Uninor For Micromax, Samsung ,, SOny. MTNL APN for MIcromax, Samsung, Sony. If you are struggling to make 3G or HSPA internet work proper in Android. suppose that after successfully setting apn of docomo, your android mobile internet connection would work properly. If you are having problem in accessing internet by TATA Docomo, post your comment below with specified problem, so that if could suggest the solution. Disclaimer: Although, we have taken utmost care in gathering correct APN setting of Tata Docomo service provider from our reliable resources and with our own research and experience, but we are not responsible for any inconsistency and inconvenience in accessing internet as we not a part of any of the service provider. First Make all setting and not change MCC Code because MCC Code automatically assigned in Mobile according to Mobile Network and Mobile Network Circle. I use SAMSUNG GALAXY STAR ADVANCE G350E .i use TATADOCOM Sim.i tried your information.but not H signal only E signal .plese sir give me a 3g network setting.thank u.
Im using Micrromax Ninja 3.5 Dual sim mobile..and i have doubt that is,i had made all that settings in my mobile for Docomo internet but my net not getting connected :-/ But for Vodafone my net getting connected ..If their is solution for this problm?? First you have to Remove your vodafone APN. i’m in raipur, chhattisgarh. having micromax A110Q phone with tata docomo 2G connection. youtube and other online videos not playing but non-video files/pages are getting opened. I have a tata docomo no. and enjoying internet facility provided by the company….but i can not access my what’s app and other social networking sites…kindly send me setting so that i can enjoy the internet facility…. U can use whats app by selecting TATA INTERNET and not DIVE IN. Hello kirnaManoj… ‘H’ symbol signifies “High speed” i.e 3G, While ‘E’ signifies for “Edge” connectivity. In your Samsung Grand mobile, go to network settings and then select “Network Mode”. If your network operator supports 3G connectivity in your area then select WCDMA, which will restrict the mobile to operate on 3G network rather then Edge. I was struggling with low internet on my “HTC desire 500”. bcoz it was set as “GSM only” not WCDMA only”. Now i am getting H and internet running awesome. I purchased this phone yesterday and thought its issue with phone but thanks to you dear. I have also brought HTC Desire 500 and facing the same issue with TATA DOCOMO N/W . I tried WCDMA only but the phones then looses n/w can you please share your APN settings here? Well if this didn’t work then try adding 8080 as your port number too. I follow the steps and my internet is connected but till my google play and whatsapp is still not working, please let me know the actual reason for this. my tata docomo mobile network is not working..data transfer sign is showing but internet is not working..plzz help..
Oops… Thanks a lot. It really works for me..!!! hey i m using tata docomo 3g. its really works good. but its disconnects automatically several times. tell me what i do that its not disconects automatically?? You need to get 3G activated first. Also check with customer care if your area has 3G coverage. i did as you’ve told. But, the internet is not starting. Everytime i open the browser, a box shows, nosignal for mobile networks. I have installed docomo internet settings. My mobile set is samsung galaxy s duos 2. please help me. initially it worked i downloaded whatsapp but after one hour it stoppped working. i m using sony experia e. i can’t connect to internet. i can’t connect to internet. In my mobile,proxy,port,username, password,server,MMSC, MMS port, MMS proxy these items have deleted. and in my mobile MMC code is 035 and not 47. I’m using samsung galaxy grand i19082 nd I’ve configured new APN but it didn’t work.the internet is very very veryyyyyy slow. When I try to access google it is returning as page can not load at this time please try again……. i am using samsung galaxy quattro.. i have followed every procedure as shown above.still i’m not able to access internet. it doesn’t even show any sign (H or E). I followed the every steps as your instruction in my samsung galaxy star pro – DUOS mobile but till now showing “can not load search result”, I trying continue 3 / 4 days but is still not working, please let me know the actual reason for this. I am leaving in Kolkata, Please mail me. Very useful information, thank you who ever gave this information. It worked perfectly for me. It worked perfectly for Samsung Y.
when I change the network settings as above and restart my mobile it will automatically set back to default settings – please advise. I purchased HTC Desire 501 dual sim. I tried above settings. After entered the above setting the APN is deleted. Please help me. When I am changing the MNC and saving the setting APN profile got removed from apn. i m using iball tab..
i buyed a sim for internet but the salesman gave me sim of computer accessing..
can i convert it into the normal sim of internet…..???? I m also not getting “E” or “H” connection in my cell phone..
After complete the above settings,internet is not connecting in samsung galaxy s duos .Any Idea? am using an android tablet that doesnt support sim card but can connect internet through dongle. i could connect with mts mblaze but i couldnt get internet with tata photon 3g. i cant set the apn as there is no save option. will anyone plzsz help me?? my problem is that i can’t access net on my samsung mbile from some days on my tata docomo no. Many times i registered complaints reagrding this but not yet any solution is given . so plz solve my problem . With all these settings I do get ‘H’ or ’3G’. But the problem is, I am not able to browse through net. Each time I launch a browser I get a message saying “AUTHENTICATION VIA THE PROXY SERVER WAS UNSUCCESSFUL”. Only thing I can do is use whatsapp. But even in whatsapp I cannot download or upload the pics. Please help me. Docomo customer care is hopeless. Please help if anybody have solution. I m having Sony Xperia t2 ultra handset nd having 250 rs 1gb 3g plan. I created apn according above given BT Mah 3g access is not working it’s showing me 2g sign “E” with 2g speed.plz help anyone have solution. i got tata docomo sim of maharashtra. i can’t access internet on my tablet (i ball slide).in mumbai. I’m using this phone with docomo sim…. thnks alot :)) it worked !! i m using canvas4 ….3g is not catching in docome even after following above steps…pls suggest soln…. Play store and Watsapp nt working since 10 days. .. It says while opening Wass up dat unable to connect. ..Plz try later. .. I have use samsung gt-s5360 in tn. I use tata docomo but internet connection is very slow plz reply a settings to me. I have HP Slate6 VoiceTab with Vodafone (Sim1) and Aircel (Sim2). I want to connect Tata Docomo 3g Dongle to it. Where shall I add APN ? on Sim 1 or Sim2 ? It doesn’t allow me to create new APN under Sim1. There are already 2 APNs for Vodafone. How To Setup REDMI NOTE ??? I Am done With Above Setting. Still No Result.. I am also facing the same problem with REDMI NOTE. Did your problem resolve? I also facing same problem.. I have samsung galaxy note3 Verizon. It not support tata indicom net. Pls help me. I filled all the field according to your settings and when i fill my state region cod of mnc 031 to 030 as u said then network apn is lost all the time and i am using micromax colours can you please say about this. thank you soooooo much yr its working…in micromax A94.. This setting would not provide free internet. I’m using xiaomi redmi note mobile. I folllow all above step but i didn’t get the internet setup in mobile. Hi all, went through most of the comments made above. One thing we all will agree that finally it boils down to the network coverage of tata docomo. Sir I have followed all the steps for 3g net but the settings are not getting saved pls help me. Thank you very much, your guidance helped a lot to fix my APN setting!! Thanks for your guidance…it helped a lot!! Thank you very much……for sharing such valuable information. Thank you. nice information provided by you & work easily. thanq so much.its working nw. Thanks. the settings mentioned above worked for my phone Micromax Android version. All i did was created a new APN with the details mentioned and reooted the phone to get this work. I’m using tata docomo SIM in my panasonic t40 handset with 3g internet pack and I’m unable to use 3g internet service .whenever I switch to 3g only network from 2G or 3g (auto) mode then it shows no signal on my handset . Tell me how I’ll overcome from this problem???? I am using Lenovo A 6000 along with TATA DOCOMO 3G. Before 10 days 3G was working great on my mobile but from 4/5 days when i recharged my number with 99/- for 512 mg 3G data, it is not working. Even on the main screen service is showing TATA DOCOMO 2G. I had tried to start 3G and send message on 53333, but if keeps saying that 3G is already activated on my number. 400 mb Data is also there in the pack. I had tried changing the APN settings and found that the settings are already right. I had called customer care service also, but in vain. I will be glad if you can solve this. I am using Celkon 2GB express, and using sim Tata Docomo. Inspite of repeated efforts Iam experiencing difficulty in getting the internet connected through the settings mentioned by you. kindly send the correct settings by mail. Thanks a tonne. It worked. I’ve upgraded my Samsung Galaxy S3(i9300) to CynogenMod13, after which I dont find any APNs in my internet settings, also tried many things in manual but still unconnected. I have not earned 3g tata docomo net, so please tell me how to earn. IS TATA DOCOMO NET 3G NOT WORKS IN ROAMING IF YES THEN HOW ?